← What are environmental flows? One of the often quoted facts about the city of Birmingham is that it has “more miles of canals than Venice” although as others have pointed out before, that fact somewhat misses the point. It’s somewhat disingenuous in any case as Birmingham is much bigger than Venice (thus has a lower density of canal) and there are other cities (such as Amsterdam) who can make similar claims. 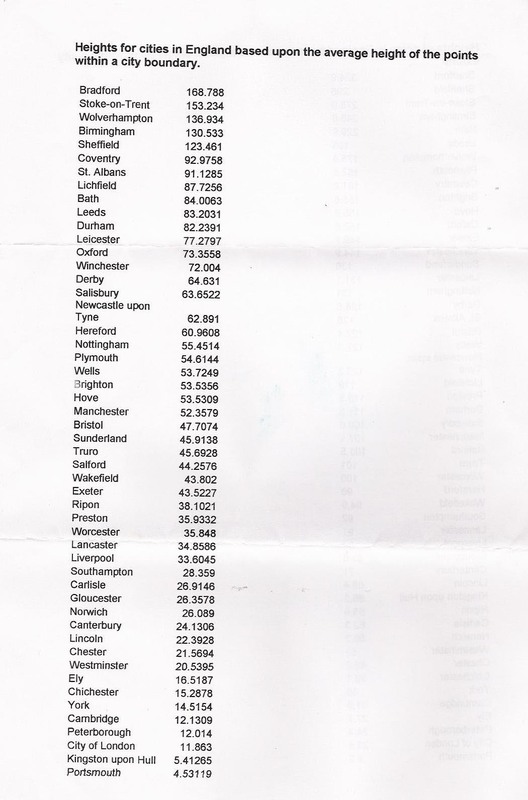 A far more fascinating fact from a river management point of view is that Birmingham doesn’t really have any rivers. Birmingham has three named water courses flowing through it: the River Cole, River Tame and River Rea. At the point they flow through Birmingham none of these rivers is large enough or deep enough to be navigable by any boat of a reasonable size (i.e. by nothing much larger than a canoe). I believe this makes Birmingham almost unique as a temperate large metropolitan area without a port or a navigable river (along with its West Midlands cousin Coventry), although am happy to be proved wrong (in the comments please!) My criteria are the region the city is in has to be temperate (so arid cities don’t really count, although I’d be happy to have examples), and the city has neither a lake or sea port or a river capable of taking boats at any part of the year – get thinking! However despite it’s position as an almost riverless city Birmingham has a lot to interest the river manager and catchment hydrologist. The reason for this is Birmingham is one of the highest cities in the UK at an average of 130m above sea level and straddles the boundaries of two of the UK’s great watersheds. Very roughly speaking the M5 and M42 motorways are the boundaries between the catchments of the River Trent (central Birmingham) and the River Stour (The Black Country). Thus a drop of rain falling within the Woodgate Valley Country park, to the West of the city will eventually make its way East via the Bourn Brook, past the University of Birmingham campus, into the River Rea in Cannon Hill Park (a river so degraded it had the lowest ecological status of “poor” in 2009! ), through and under the city centre before meeting the River Tame under junction 6 of the M6 (“Spaghetti Junction“). 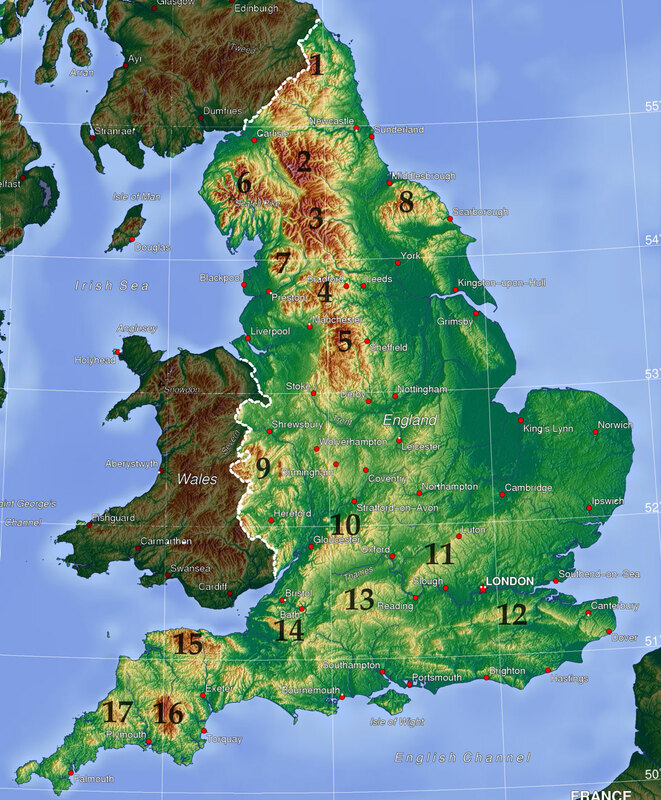 From there it makes its way North and meets the River Trent north of Lichfield and flows past Nottingham, Newark and meets the Humber between Goole and Hull and eventually out into the North Sea via the Humber Estuary. Conversely a drop of rain falling just slightly to the West of the Woodgate Valley park, would makes its way via one of the small tributaries of the East Stour just South of Halesowen, past the ruined Abbey and into the River Stour proper where it would flow through Dudley, Stourbridge and Kidderminster before meeting the River Severn at Stourport-on-Severn. It then flows via Worcester and Gloucester and out into the Bristol Channel. So a rain shower to the West of Birmingham will see some rainwater flow eventually into the North Sea and some, falling just a few hundred metres away, flowing into the Bristol Channel, over 200 miles from the Humber Estuary. Although it has no large river flowing through its centre, Birmingham’s position at a high point on the boundary between two of the great river catchments in the UK makes it interesting and important from a hydrological perspective. 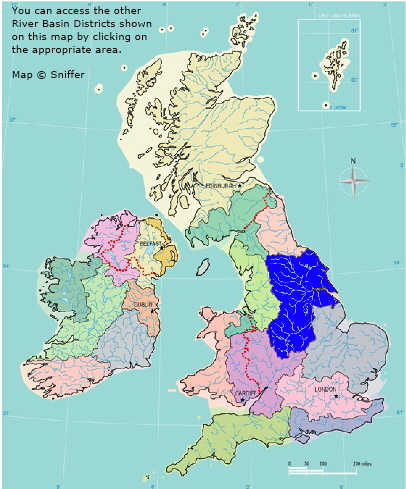 With regards to the water framework directive combating the degraded quality of some of the small streams and rivers in and around Birmingham, particularly diffuse pollution, can have a knock on effect upon water quality and ecology within the Trent and Stour and thus the Humber and Severn. Given the large population and the lack of a large river to discharge treated waste water into, water treatment in Birmingham has to embrace new technology to ensure the effluent they discharge is as clean as possible. Although many people may not want to think about it waste water treatment discharge operates to a degree on the principle of dilution! This means if one is discharging effluent directly into the Seven or Thames a less clean discharge will be quickly diluted within the large discharge of the river to minute concentrations, which is not the case if it is discharged to a small river. This illustrates that even a city without a river needs to be considered as part of a catchment wide approach to river management. Don’t forget to post your examples of other big cities with neither large rivers or ports (lake or sea) in the comments. This entry was posted in Geomorphology, Hydrology, River Management, Uncategorized, Urban rivers, Water Framework Directive, Water quality. Bookmark the permalink. Another US southern city that could be considered riverless is Atlanta. It’s on a divide between water flowing to the Atlantic and water flowing to the Gulf of Mexico. The Chattahoochee flows northwest of the city, but I don’t think the city has much of a cultural or economic connection with the river. The reservoir from which Atlanta draws its water has a very small watershed, contributing to problems with water scarcity in this mega-city of the humid South. Atlanta is on the Chattaboocee plenty of river races and rafting pictures from the 1970s, maybe Allanta is too advanced to care about the river but none the less, it is a significant river. now Delta Hub and growing fast. It’s a good example, but it’s a little smaller than a “big city”! Towns which grew up post-industrial revolution are interesting cases as the expanding canal and railway networks served the transportation function that navigable rivers once would have, and development of water pumping technology meant settlements were not so reliant on rivers for their water and/or disposal of waste water. It reinforces my point about the scarcity of riverless cities in a way. Pre-industrial revolution, the absence of a navigable river or port would have provided a natural brake on how large a settlement could grow, due to the need to import in goods/food/raw materials to feed the settlement’s growth. That being true the only modern large cities without rivers/ports would have expanded rapidly from a small size to a large city in the last 100yrs or so as technology enabled them to overcome the natural barriers to expansion. On a smaller scale this is what fuelled the growth of Swindon as the canal, railway and later the road network connected the town (village) to the surrounding area allowing goods to be bought in easily. But Swindon is on the River Ray. I live at Station Road in Northfield and have always been (mildly) interested in the Rea, since it flows alongside Cannon Hill Park and the MAC, both of which I visited many times in my teens. The river runs behind my house and there is a terrible smell of effluent just outside my house, particularly in warm weather. You can only smell it from that particular point in the road. I always assumed it was from the drains, an opening to which us right there in the gutter. But walking over the Rea on West Heath Rd recently, I have have noticed the same strong smell, particularly during periods of dry, hot weather. Andrew, I hate to be the bearer of bad news, but I think it is likely domestic waste water discharging straight to the river. There is a spot I am aware of on the R.Rea in Cannon Hill Park at the back of Third Avenue/Forth Avenue that is also very bad. It is all to do with the way our sewers are connected. A lot of UK sewers, particularly older ones, are “combined” meaning rainwater from roofs and waste water all goes into the same sewer and goes to the treatment works. These are designed to “spill” into rivers during flood flows (to stop them overflowing elsewhere or overwhelming treatment). However in some places the street storm drains discharge straight to rivers, under any older street there is probably a mess of new and old pipes. Sometimes (probably more often than we might hope) there are “cross-connections” and, typically when there are new/remedial plumbing works, waste water drains are plumbed into pipes which discharge to rivers. So rather than this waste water going through the sewers to the treatment works it is going into a surface water drain and straight to the river. You can imagine in Birmingham where in a lot of the Victorian era houses indoor toilets were installed after the houses (and all the sewers) were built, and so there will be thousands and thousands of indoor (and second) toilets that are been retrofitted over the city, chances are quite a few will have been plumbed wrong… That’s not to mention dishwashers, who’s waste pipes tend to be done via DIY and which carry food waste. When it is hot and dry the waste water volume is the same (broadly) but the flow in the river is less, and so the effluent is more concentrated in the river water, it also might be the case that the drain outfall is more exposed. That is why the smell is worse in hot-dry weather. The big problem is that it is quite time consuming to trace back an outfall with erroneous waste water to a specific house and/or drain. I have no facts to back this up, but I also suspect the issue isn’t taken as seriously as it perhaps should be. So I am not aware of any concerted efforts to tackle the problem, either in Birmingham or elsewhere in UK. Thank you, Simon, that is an excellent and comprehensive reply to my unstated question. I’m sure you’re right. These houses would all have had outside lavatories, originally, and yes it’s probable that, as you suggest, some of the retro-fitted internal sewage waste pipes are emptying into the drains bound for the river. Fortunately, while unpleasant, the smell is ‘livable’ with, as it doesn’t come into the house and I only pass through it momentarily as I walk up the road. It’s not so bad in the colder weather. What about the effect on wildlife and fish! There are no fish in the open sewer that is the river Rea. Meanwhile the politicians and planners ignore this and spend billions building high profile shopping and office complexes at the city centre as the sewage river passes hidden underneath. The second city doesn’t give a damn for the environment!